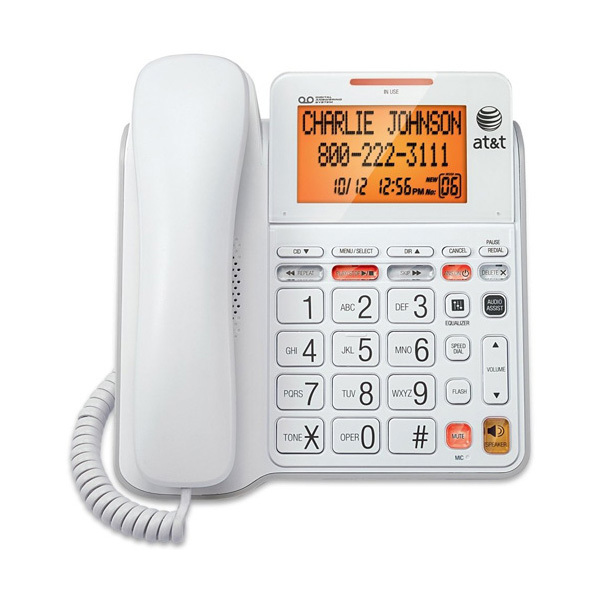 AT&T Corded Speakerphone with Digital Answering System, Caller ID, Call Waiting And Tilt Display. 19 minutes of recording time with remote access, time/day stamp and Message Guard® memory for power failures. 65 name/number caller ID (activation required). 10-number memory. Extra Large buttons and hearing aid compatible. Hands-free speakerphone with volume control. Tri-lingual setup menu - English, Spanish, French. No Batteries Required. Includes mounting base.